Chronic obstructive pulmonary disease (COPD) is a term used to refer to a set of chronic lung diseases with pulmonary manifestations (e.g. emphysema, chronic bronchitis, or a combination of both) resulting from exposure to inhaled irritants such as cigarette smoke and environmental pollutants. 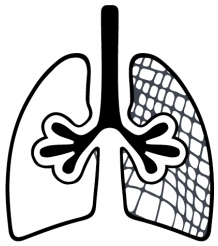 Learn more about COPD on our website dedicated to respiratory research and inhalation exposure.